When I wasn’t exploring the great outdoors with Robin in Zürich, I took time out of the busy, active lifestyle to do a little bit of sightseeing. The city centre of Zürich itself wasn’t exactly huge, or full of iconic landmarks, but simply wandering around the charming little streets and up the cobblestone footpaths was a pleasure in itself, appreciating the quaint and classical beauty that the city maintained. 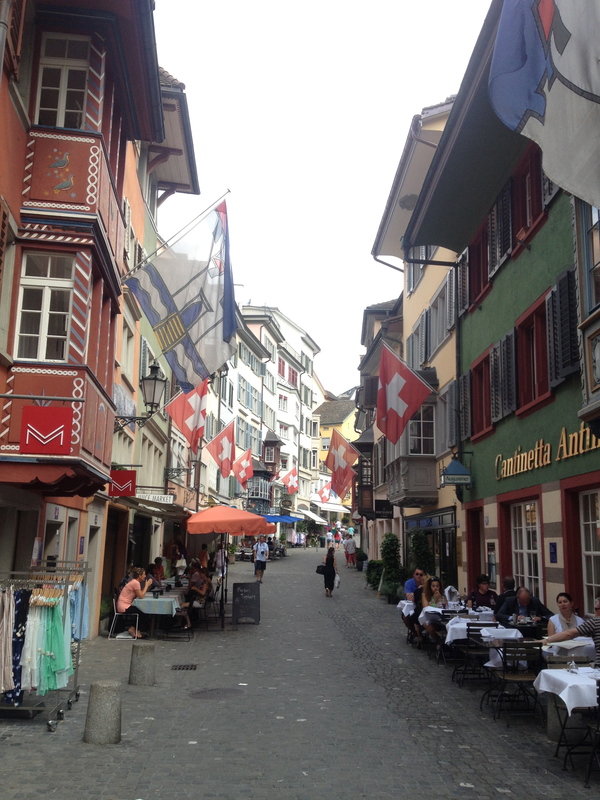 A cute little Swiss street that is obviously very proud to be a Swiss street. Gedenkbrunnen für Bürgermeister Stüssi, or Stüssi’s Fountain, which I accidentally stumbled across in my roaming. 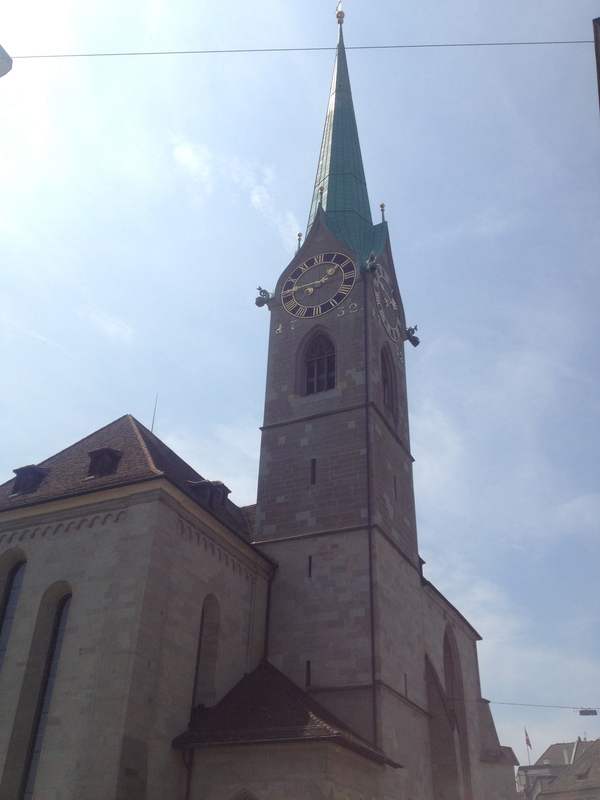 The most notable sights worth seeing in Zürich were probably the small handful of churches located in the city centre. While I had sworn I was done with churches after my trek through the Vatican City in Rome, these Swiss churches couldn’t be more different from the St Peters Basilica in Italy. They were a fraction of the size, modestly squeezed in between all the surrounding buildings, though the classical design suggested that the holy buildings had been there much longer than their neighbouring structures. 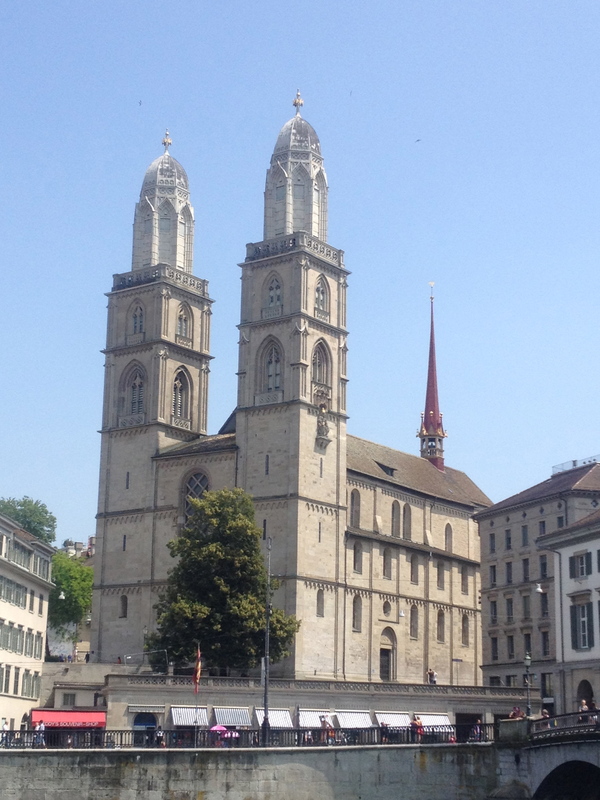 The first of the three main churches in Zürich that I passed is called Grossmünster, which translates into “great minister”. It is located along the banks of the River Limmat and served as a monastery church when it was first inaugurated some 800 years ago. The Romanesque architecture was impressive from the outside from where I admired it, but it was a beautiful day outside, and I just wasn’t in the mood for trailing through another church museum. So on I moved across the Limmat, where the other two main churches were situated – next was St Peterskirche, or St Peters church. The structure itself was significantly smaller than Grossmünster, and it was in the midst of a sea of buildings to the point where I couldn’t actually find the building itself. However, the main feature of St Peterskirche rose above the sea of buildings so that it could be seen from a great distance – the clock tower. Again, I wasn’t particularly interesting in seeing the inside of yet another church, and the main feature was best viewed from a distance anyway. 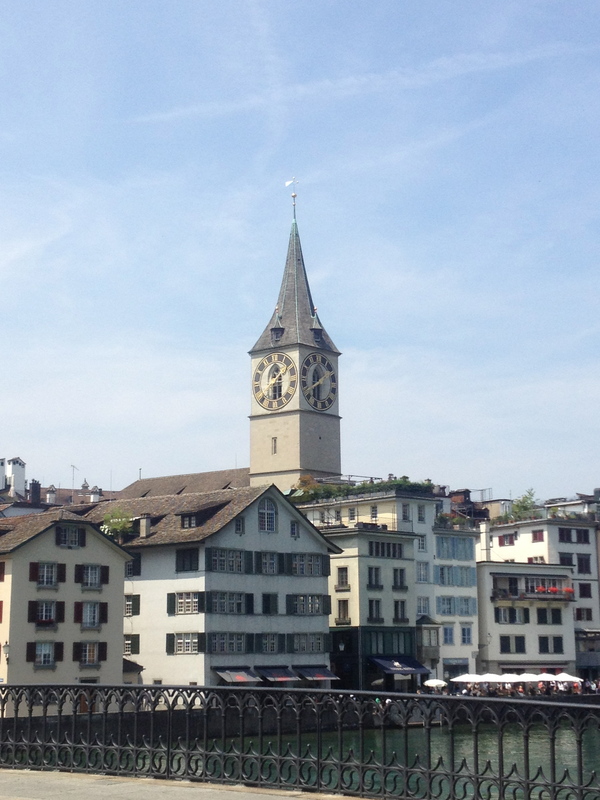 “The clock on that steeple is the largest clock face in Europe,” Umer had said to to me as we’d breezed through the city on my first afternoon in Zürich. It has a diameter of 8.7 metres, but I hadn’t previously managed to capture any photographs of the impressive clock, so I took a few snapshots before moving on to the third and final church. The clock tower of St Peters church. Fraumünster was the only church in Zürich that I actually went inside, but in retrospect I’m glad that I had made the time to take a quick peek. The English translation is “women’s minister” and the church, which is built directly across the Limmat from Grossmünster, was built on the remains of a former abbey. From the outside, Fraumünster doesn’t seem particularly impressive. However, once you set foot inside the cool and quiet halls, you quickly realise that it’s the inside perspective and the view from within that truly matters in these sacred rooms. I’m talking, of course, about the stained glass windows. From the outside on a bright sunny day they look incredibly unremarkable: black holes leading into the depths of the church. But from the inside, that sun streaming in lights up the coloured panes of glass to produce something beautiful, mystical, and even a little breathtaking. I reiterate that I’m not exactly religious and have no affinity with the Christian faith, especially after the disillusionment that came with my visit to the Vatican, but something about being in Fraumünster recaptured my sense of mysticism. Fraumünster, looking deceptively plain from the outside. Back in my days at university I took quite a variety of sociology courses, one of them being a class titled the Sociology of Religion. In the first lecture, our teacher read us a metaphor about religion being like a stained glass window. You can study a religion from the outside – the rituals, the doctrine, the history, the beliefs – but the real meaning of a religion requires an understanding that one can only get from being inside of the fold, and being a part of that religion. Perhaps thats why, whenever I step into any of these beautiful churches far and wide across this continent, I get that superstitious sense that I just can’t quite put my finger on. Until you’re ready to fully accept it and be a part of it, maybe you’ll never be able to truly understand what it means to be part of a religion. I doubt that I ever will fully know what that is like, but for the meantime I was definitely understanding the stained glass window metaphor first hand. I tried to take a couple of photos, but the quality of my camera did absolutely no justice to the images I was seeing in front of me. Not for the first time, I took it as a sign that some things we experience in this world as just so significant to ourselves as individuals, that attempting to share them with others would simply fail to have the same effect on them as it did on us. So I momentarily lost myself there, in the cold stone chambers of Fraumünster, before saying a silent prayer – to who, I’m still not sure – and exited back out into the sunshine. After my church sightseeing and soulful contemplation, I lightened the mood of my day with a stroll through the sunshine by the lake. 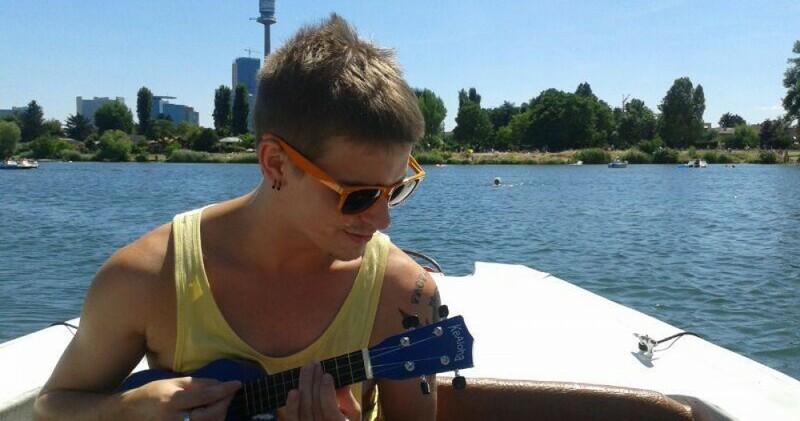 This was before the afternoon of slacklining with Robin, so I hadn’t been swimming in the lake or river at that point. I found a seat on a bench and read my book for most of the afternoon, but I did come across a huge diving platform from which people were jumping off, and plunging into the depths of the crystal clear water. I considered doing it myself, but at that stage I wasn’t exactly feeling 100% healthy – I was still feeling a little under the weather, and recovering from the effects of prolonged partying in Madrid during Pride. I knew I would inevitably be getting wet when I went slacklining over the river, but I didn’t want to wait around in wet clothes for the rest of the afternoon, so instead I contented myself with watching others jump off the huge platform and into the water. 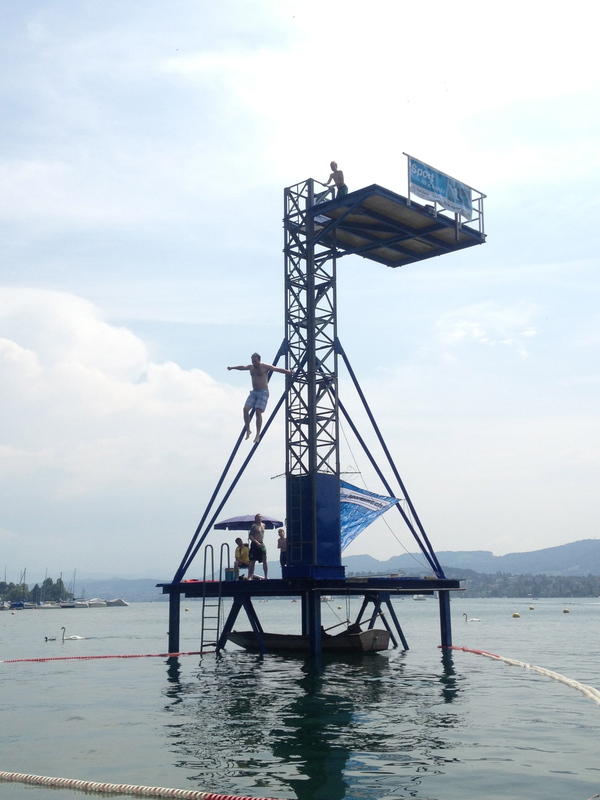 The huge structure that had been set up in the lake, from which people were jumping off into the water. There is one thing that I found shocking about Switzerland, even though it wasn’t exactly unexpected, and that was the cost of living. I had been warned about it, but it still hit me like a slap in the face. I wasn’t even paying for my accommodation, but my time spent in Zürich was fairly limited simply due to the fact that I didn’t have the budget to do very much. Even eating was a ridiculously pricey affair. I went to get lunch from what seemed to be a relatively cheap sausage stand – they love their wurst in Switzerland – and ended up paying around 6 francs for a simple sausage and a small piece of bread. I felt like that would have almost bought me a meal in any other country, but from what I had seen of the rest of Zürich, I had basically stumbled across a bargain. I considered it a blessing in disguise that I wasn’t feeling too well during my time in Zürich, because it meant that I didn’t have the desire to go out and investigate many of the bars or nightclubs – something that I just didn’t have the funding to do there. Robin and I visited a bar or two and sampled some delicious Swiss beer, made in various microbreweries around the country, but for the most part Switzerland was a continuation of my much needed down time. My pride tour down western Europe had really gotten the better of me. 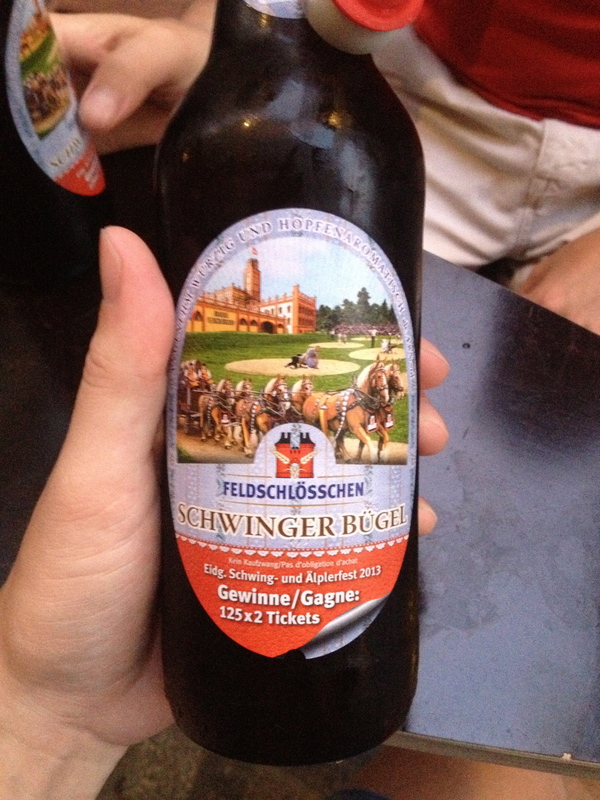 One of the Swiss beers I shared with Robin. 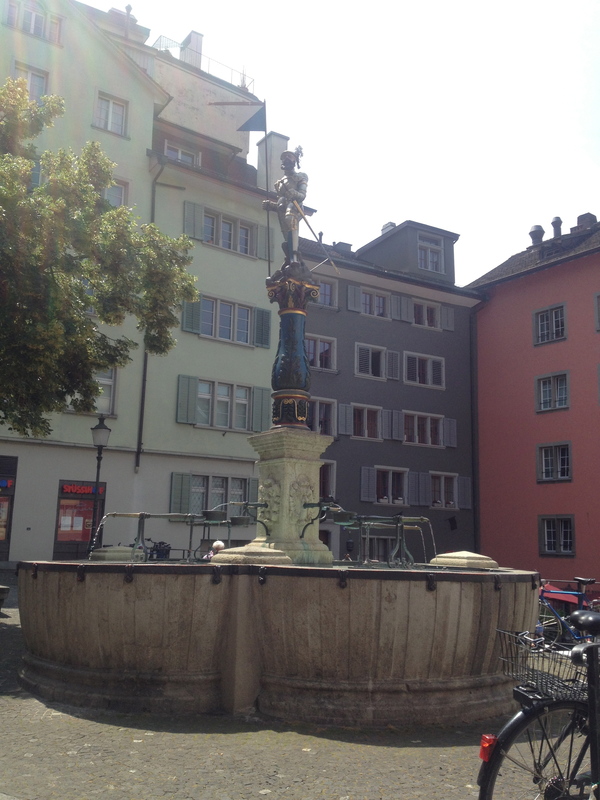 Eventually necessity required me to move on from Zürich – there were a handful of other destinations I still had to hit before my Eurail pass expired, and I just couldn’t afford to stay in Switzerland any longer. So on my final morning I packed up my bags, thanked Robin for his hospitality, for introducing me to the world of slacklining, and inspiring me to be that little bit more physically active in my life. Then it was onto the station for another train, another country, and another city on on my ‘greatest hits’ tour of Europe.